Description: Deciduous shrub or small tree (10-20+ ft.) with pinnately compound leaves, small white flowers in flattened clusters (early summer, later than S. racemosa), and blue berries. Although the berries are edible, some sources advise cooking them first. Elderberry is a fantastic shrub for wildlife and a beautiful addition to any garden. Birds who enjoy elderberry fruit include sparrows, thrushes, warblers, bluebirds, jays, tanagers, grosbeaks, sapsuckers, woodpeckers, and band-tailed pigeons. Hummingbirds, bumblebees and butterflies are attracted to the flowers as a source of nectar. Fast growth rate. Blue elderberry is usually found east of the mountains near water, but also thrives in the Willamette Valley. It prefers more sun than Red Elderberry. Sun/part sun, regular water, well-drained soil. 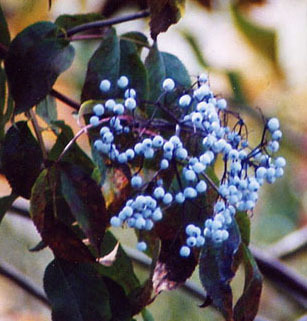 In February of 1806, Lewis remarked in his journal: "The Elder also common to our country grows in great abundance in the rich woodland on this side of the rocky Mountains; tho' it differs Here in the coulour of it's berry, this being of a pale sky blue while that of the U'States is a deep perple."